To Cite: Smyth J K, Ng K S, Sinclair E C, Kuo S. Hepatic Choristoma: an Unexpected Finding During Cholecystectomy, J Minim Invasive Surg Sci. 2015 ; 4(1):e21162. Introduction: Hepatic choristomas, defined as completely separated ectopic liver tissue, are rare. They are most commonly found adjacent to the gallbladder. Details of their anatomy, such as blood supply and biliary drainage, remain ill-defined and are inconsistently described in the literature. Case presentation: A case of hepatic choristoma was found incidentally in a 77-year-old woman during an elective laparoscopic cholecystectomy. Conclusions: We outlined its biliary drainage and blood supply, as well as our surgical approach, which may be a guide to surgeons who encounter hepatic choristomas in their clinical practice. Hepatic choristomas, defined as completely separated ectopic liver tissue (1), are rare. There are less than 100 cases reported in the literature, and the majority of reported cases were incidental findings during surgery or autopsy (2). Documented sites for hepatic choristoma deposits include the gallbladder (both sub-serosal and intra-mural), omentum, retroperitoneum and thorax (2), but details of their anatomy, such as blood supply and biliary drainage, remain ill-defined and is inconsistently described. A 77-year-old woman underwent a laparoscopic cholecystectomy for uncomplicated cholelithiasis in the Department of Upper Gastrointestinal & Hepatobiliary Surgery, Macquarie University Hospital. She had a one-year history of intermittent right-upper-quadrant (RUQ) abdominal pain, typical of biliary colic, and no jaundice, change in stool or urine colour. Her past medical and surgical histories were unremarkable. Abdominal examination revealed mild tenderness in the RUQ without peritonism; Murphy’s sign was negative. General examination of other organs was unremarkable. Abdominal ultrasound demonstrated multiple mobile gallstones up to 13 mm, no findings suggesting cholecystitis, and the biliary drainage system (intra- and extra-hepatic) was not dilated. Notably, an ill-defined focal region of fat-sparing was seen adjacent to the gallbladder fossa with mild diffused fatty infiltration in the liver. A standard four-port laparoscopic cholecystectomy was performed for this patient. Before any tissue dissection, a moderate-sized tissue mass with hepatic appearance was unexpectedly identified adherent to the gallbladder fundus (Figure 1 A). Careful inspection revealed two tubular structures connecting this tissue mass to the left liver lobe. Dissection of Calot’s triangle revealed normal anatomy of the cystic duct and artery. An intra-operative cholangiogram was normal, with neither filling defect of the biliary drainage system, nor any evidence of aberrant biliary drainage from the tissue mass. The two tubular structures passing to the left liver lobe were cleared of surrounding tissue, ligated with 5 mm metal clips, and divided (Figure 1 B). Clinically, it was presumed that these structures represented an artery and vein supplying the tissue mass; however, a separate draining bile duct was not identified. The remainder of the operation proceeded without complication. Histopathological examination confirmed the tissue mass to be a hepatic choristoma. The choristoma was sub-serosal and 20×15×10 mm. Microscopic examination of the choristoma demonstrated normal hepatic parenchyma with normal lobular architecture. 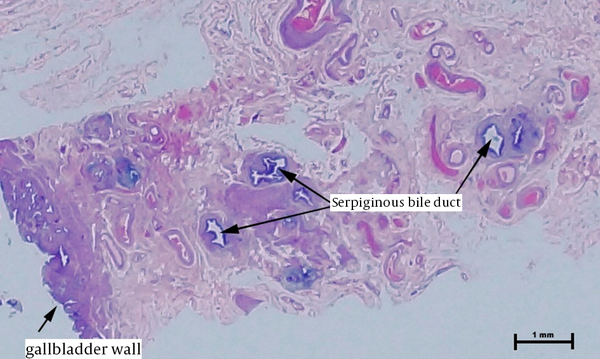 A small bile duct structure (0.5 mm) followed a serpiginous path from one pole of the choristoma towards the gallbladder wall (Figure 2). The duct entered the gall bladder in the vicinity of its neck, however the definite point of entry was difficult to be ascertained in the context of superimposed chronic changes. This case represents our second gallbladder-associated hepatic choristoma in a total of 7,639 excised gallbladders at our pathological laboratory since 2008. This represents an incidence of 0.26%, which is somewhat less than the reported incidence of 0.47% (3). Several mechanisms to describe the development of hepatic choristomas have been proposed. The most prominent theory suggests that ectopic liver results from migration or displacement of a portion of a rapidly growing hepatic diverticulum destined to become the liver during embryogenesis (4). This assertion is supported by the fact that choristomas are usually localised within structures that have an adjacent origin of organogenesis to the liver (2). Hepatic choristomas are generally asymptomatic. However, in rare cases, they may be associated with abdominal pain or portal hypertension (2). Incidental, intra-operative, visualisation remains the commonest method of identifying gallbladder-associated hepatic choristomas (2). Despite usually being an incidental finding, a considered surgical approach is indicated.. Indeed, as demonstrated in our case, hepatic choristomas may be supplied by sizeable vessels from the mother organ, which need to be carefully identified and secured lest troublesome (and potentially profuse) bleeding may be encountered. Further, although our case demonstrated direct biliary drainage into the gallbladder, it is possible that choristomas may have a separate draining bile duct to the liver that requires similar surgical ligation. With these surgical principles applied, en-bloc resection of the choristoma is the usual approach described. Whilst this is probably because en-bloc resection represents the ‘easiest’ option, it should be noted that untreated choristomas have also been documented to pose increased risk of certain pathological processes. For example, an increased incidence of hepatocellular carcinoma has been noted, independent of pathology of the mother liver (5-8). Proposed mechanisms of carcinogenesis include metabolic dysfunction, caused by compromised blood supply and/or biliary drainage. These findings add further reason why choristomas should be resected en-bloc rather than preserved. This case demonstrates the importance of recognising variations of normal anatomy encountered during standard surgical procedures. Hepatic choristomas, although rare, require a considered surgical approach. Special recognition should be paid to the inconsistent description of their blood supply and biliary drainage, and therefore, careful tissue dissection is necessary to allow safe en-bloc resection of these ectopic lesions. Authors’ Contributions: Study concept and design: Kheng Seong Ng, Samuel Kuo. Acquisition of data: Julian Klaus Smyth, Kheng Seong Ng, Elizabeth Caroline Sinclair and Samuel Kuo. Analysis and interpretation of data: Julian Klaus Smyth, Kheng Seong Ng, Elizabeth Caroline Sinclair and Samuel Kuo. Drafting of the manuscript: Julian Klaus Smyth, Kheng Seong Ng, Elizabeth Caroline Sinclair and Samuel Kuo. Critical revision of the manuscript for important intellectual content: Julian Klaus Smyth, Kheng Seong Ng, Elizabeth Caroline Sinclair and Samuel Kuo. Statistical analysis: Julian Klaus Smyth, Kheng Seong Ng, Elizabeth Caroline Sinclair and Samuel Kuo. Administrative, technical, and material support: Julian Klaus Smyth, Kheng Seong Ng, Elizabeth Caroline Sinclair and Samuel Kuo. Study supervision: Kheng Seong Ng and Samuel Kuo.